REVERE cookware have been part of American history since patriot and silversmith Paul Revere started making copper sheathing for naval vessels in 1801. Paul founded Revere Copper Company which evolved into Copper and Brass, Inc., the makers of Revere Ware Copper Clad Stainless Steel Cookware. Today, REVERE cookware is one of the most recognized and preferred brands of metal rangetop cookware, known by consumers for its legendary heritage, quality and durability. With a strong commitment to consumer research and technological advancement, the REVERE cookware team constantly introduces new, innovative products adapted to changing consumer needs. 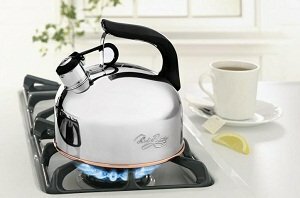 One of the first names in tea kettles, Revere offers a range of high-quality polished stainless steel models with copper bottoms for quick and even heat distribution. Polished stainlesss steel exterior is low maintenance. Traditionally styled, the kettles feature easy-grip, black phenolic handles, and whistling spouts. Constructed of high quality stainless steel polished to a mirror finish for lasting beauty. Phenolic handles are cool to the touch. Signature copper bottom for quick heating. World Kitchen, LLC will replace any defective tea kettle within one year from the date of purchase. Warranties do not cover damage caused by accident, misuse, abuse, commercial use, or attempted repair. Also scratches, stains, discoloration, warping, pitting and damage from overheating are not covered under these warranties. The owner must follow the Safety & Usage Instructions provided with the product. Should a warranty problem develop, contact the World Kitchen office nearest you. KEEP THE PRODUCT. You may be asked to return it. All Revere cookware can be used on gas and electric coil ranges. Tri-Ply / Encapsulated cookware can also be used on most smooth-top ranges. Consult the owner's manual of your range for recommended cookware. BEFORE USING FOR THE FIRST TIME: Wash cookware thoroughly with hot, soapy water. Rinse and dry. Oven Use: REVERE cookware can be used in a preheated oven. Phenolic handles and knobs can be used in oven up to 350 degrees F or 175 degrees C. DO NOT put in oven when self-cleaning cycle is operating. Clean regularly. Clean lime or mineral deposits by combining equal amounts of water and vinegar in the tea kettle, bring to boil and simmer for 10 minutes. Rinse well. Repeat if necessary.